This hardcover book includes a bookplate signed by Lonardo Colombati for Backstreet Records customers, affixed to the title page of each book. Developed in cooperation with Bruce Springsteen's camp and approved by the Boss himself, Like a Killer in the Sun: Selected Lyrics, 1972-2017 is an authorized and definitive book on the work and poetry at the heart of Springsteen's music. Originally published in Italian, the book has now been expanded and published in English for the first time. 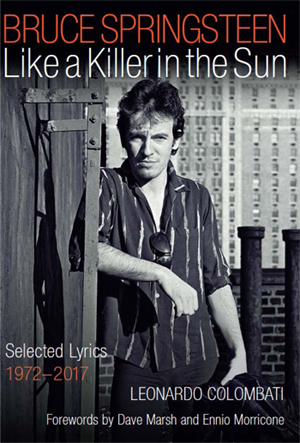 The perfect follow-up to Springsteen's memoir, Killer in the Sun was written by Springsteen's personal friend and scholar Leonardo Colombati, presenting 117 of Springsteen's best lyrics expounded and annotated with the attention and devotion typically reserved for literary classics. By dissecting Springsteen's unique narrative talent, Colombati offers an accurate and critical examination of his poetics and highlights their literary opulence, drawing attention to the fact that Springsteen is an author grafted on the same line running from Whitman to Steinbeck, from Flannery O'Connor to Raymond Carver. The book also contains a biographical timeline and discography, plus forewords by Academy Award-winner Ennio Morricone and music critic Dave Marsh. "To be perfectly clear: I now owe my friend Leo not just the debt of friendship but also the debt owed to someone who showed what was missing: the thing made hazy, all but invisible, until the right teller told the tale." Backbeat Books, hardcover, 590 pp.